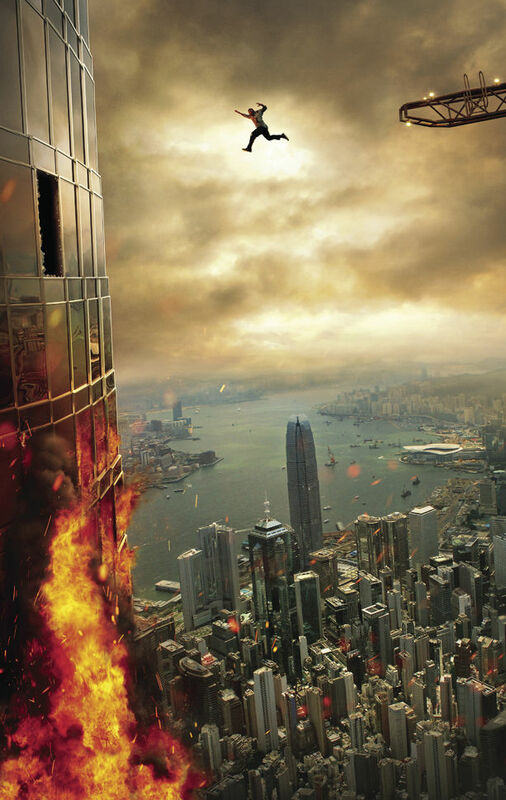 This image released by Universal Pictures shows Dwayne Johnson in a scene from "Skyscraper." We have reached peak summer, and the stores are already displaying their back-to-school deals to frighten and taunt children enjoying their lazy, hazy days while parents grow increasingly desperate for distraction. I would recommend seeing “Skyscraper,” the latest action blockbuster starring Dwayne Johnson, during one of those scorchers that leave everything wilted and the skin crispy red, when the major goal of the audience is to enjoy a dark, cool interior and a chair that won’t immediately fuse with sweaty legs. Don’t come looking for a reasonable plot, snappy dialogue, or charismatic villains. Just enjoy not melting for 100 minutes. Written and directed by Rawson Marshall Thurber (“Dodgeball: A True Underdog Story,” “We’re the Millers”) who first worked with Johnson on 2016’s “Central Intelligence,” again relies on the natural charm and presence of the actor to justify one ridiculous set piece after another. Johnson plays Will Sawyer, a former FBI agent trained in hostage rescue who was severely injured after a father detonates an explosive vest during a rescue attempt. Ten years later, he is married to Sarah (Neve Campbell), the former Naval surgeon who saved his life, and owns an independent consulting firm assessing the safety and security of skyscrapers. His latest assignment is a 200-story, cutting-edge tower in Hong Kong called The Pearl, where his family has been living during his evaluation. Its design is supposed to be foolproof and impossible to penetrate, which is why it is so baffling when the most vanilla, faceless team of terrorists slip right in and plant explosives — all because they wore the traditionally anonymous disguise of the workman’s zippered coveralls. They could not look more innocent than if they were wheeling in a wedding cake with sticks of dynamite in place of candles, but while Wile E. Coyote and his gang of thugs are preparing to turn The Pearl into an Acme funhouse of smoke and fire, it is up to Will Sawyer the Roadrunner to meep-meep! through the different levels and rescue his family. The Pearl’s creator, Zhao Long Ji (Chin Han), locks himself in the penthouse after the initial explosion, convinced that the security and fire systems will work. After repeated warnings by his bodyguards and threats from both the fire and the Coverall Gang, he still refuses to leave. I’m not sure why because it isn’t important enough to remember. The main villain, Kores Botha (Roland Moller), is described as “high-end muscle for crime syndicates” and it appears his brawn far exceeds brain. His ultimate goal seems to be talking excessively rather than the obvious action of removing the hostages from the equation. All these cookie-cutter villains seem to need is just someone to listen, because they obviously have very deep thoughts to share and “get henchman to watch my back while I sermonize” isn’t one of them. For Sarah, Will, and his leg sidekick, the maze of characters they must navigate is the tedious space between crazy scenes where anything, anything, anything can be saved with duct tape. At times, it seems like a hall of mirrors where flashes of past action films overshadow the present stunts, but if the hallmark is to believe in the triumph of Dwayne Johnson, then it at least succeeds in that.